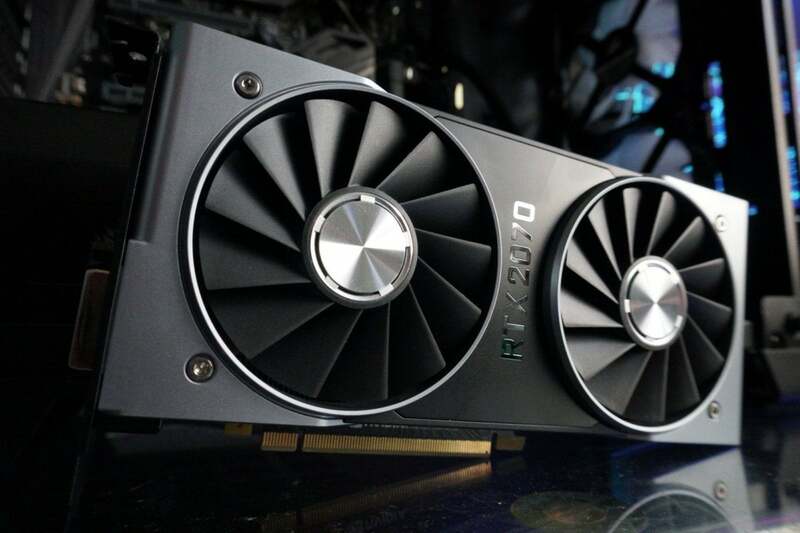 The Nvidia GeForce RTX 2070 Founders Edition packs futuristic hardware for ray tracing and AI-enhanced graphics, but it's also faster than the competition in traditional games. Should you buy the Nvidia GeForce RTX 2070 Founders Edition? Nvidia’s GeForce RTX 2070 is a graphics card built for the future, just like the GeForce RTX 2080 and 2080 Ti. And just like its siblings, the RTX 2070’s futuristic hardware comes at a stiff price premium. At a $500 starting price and $600 for the Nvidia Founders Edition being reviewed here, the inclusion of dedicated RTX hardware bumps the price of Nvidia’s traditionally midrange xx70 GPUs up by well over $100, planting it in the range of the existing GTX 1080. But unlike with the RTX 2080, Nvidia isn’t asking you to invest solely in as-yet-unfulfilled promises for the future. The GeForce RTX 2070 delivers an appreciable bump over the GTX 1080’s performance in today’s games, too. You can still find the older graphics card on sale all over the place, though, and often at a discount. Should you buy a shiny new RTX graphics card, with its untapped potential for real-time ray tracing and AI-enhanced games, over a cheaper GTX 1080? Let’s review the Nvidia GeForce RTX 2070 Founders Edition ($600 at Best Buy and GeForce.com). Nvidia added dedicated RT cores for real-time ray tracing and dedicated tensor cores for AI enhancements in the RTX series, but that wasn’t the only hardware tweak. The GTX 10-series incarnation stuck to reference speeds and a blower-style cooler that was prone to thermal throttling. This generation, Nvidia equipped its Founders Edition cards with a mild overclock and an improved dual-fan cooling solution to help justify its price premium. 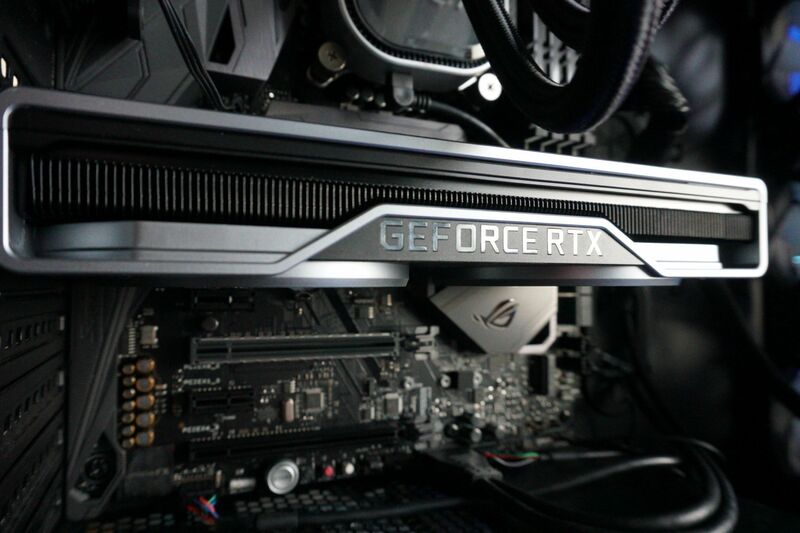 That means Founders Edition specs differ slightly from RTX 2070 reference specs. 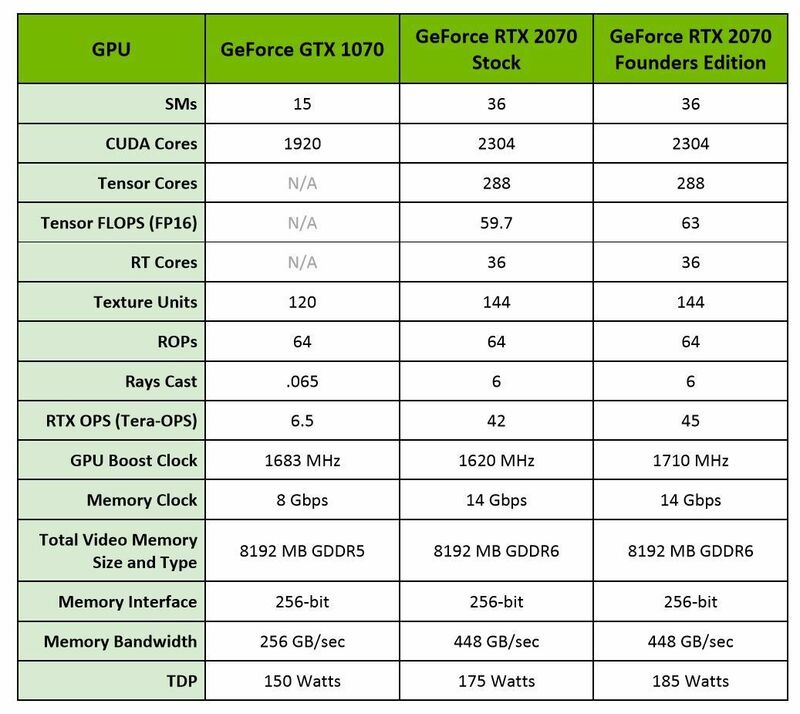 Here’s how the reference and Founders Edition RTX 2070 stack up under the hood compared to the older $380 GTX 1070 (though again, at its higher price point, the $500 RTX 2070 more directly compares to the $500 GTX 1080). 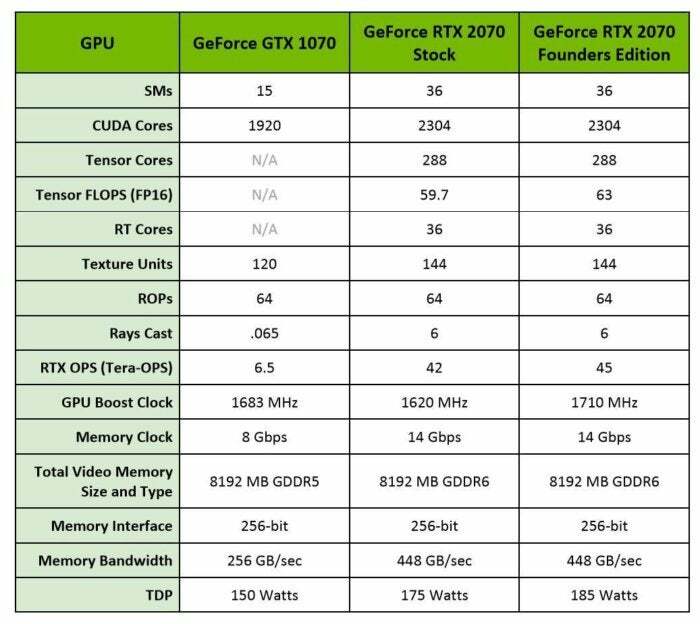 Nvidia GeForce RTX 2070 and 2070 Founders Edition specs vs. GTX 1070. As you can see, the RTX 2070 Founders Edition has more CUDA cores and texture units than its predecessor, as well as a slightly higher boost clock speed and much faster GDDR6 memory. Spoiler alert: The RTX 2070 is a lot faster than the GTX 1070 in traditional games, and even a bit ahead of the GTX 1080. It’ll be faster in tomorrow’s games, too, as the RTX 2070 includes those dedicated RT and tensor cores to drastically enhance real-time ray tracing performance and unlock the ability to bring machine learning enhancements to games, such as Deep Learning Super Sampling. Unfortunately, no current games tap into either technology, though dozens of games have pledged RTX support. The lack of available ray-traced or DLSS games is a bummer with this graphics card in particular. The RTX 2070 packs half as many RT and tensor cores as the full-fat GeForce RTX 2080 Ti, and we have no way of testing how much that will impact performance—so you’re taking a leap of faith that not only will those technologies catch on, but the RTX 2070 will be able to handle them well. Fingers crossed. While we wait for the first ray traced and DLSS games to land, you can read more about the technologies in our deep-dive into the Nvidia Turing GPU as well as the future tech section of our RTX 2080 and 2080 Ti review, where we examined some canned demos provided by Nvidia. All that extra hardware demands more power, with the reference RTX 2070 requiring 25 more watts than its predecessor, and the Founders Edition demanding 10 more than that, at 185W. Nvidia recommends using a 550W power supply. That power flows to the Founders Edition via a single eight-pin connector at the very end of card, rather than the usual edge placement. I usually loathe that configuration, but it works here, mostly because the Nvidia RTX 2070 Founders Edition is so tiny. The two-slot card measures a mere nine inches in length, or 1.5 inches shorter than typical graphics cards, so hanging the power connection off the back isn’t an issue. Other than the size, the RTX 2070 sticks to Nvidia’s incredibly successful Founders Edition redesign. It’s an absolutely gorgeous graphics card, with a forged aluminum shroud that wraps around into a backplate. Its dual fans bristle with 13 blades each, and you can see the black heat sink peeking through the edge, sitting atop a full-length vapor chamber. You’ll find dual DisplayPort 1.4 connections, an HDMI 2.0b port, DVI-D, and a VirtualLink USB-C connection for VR headsets on the I/O plate. 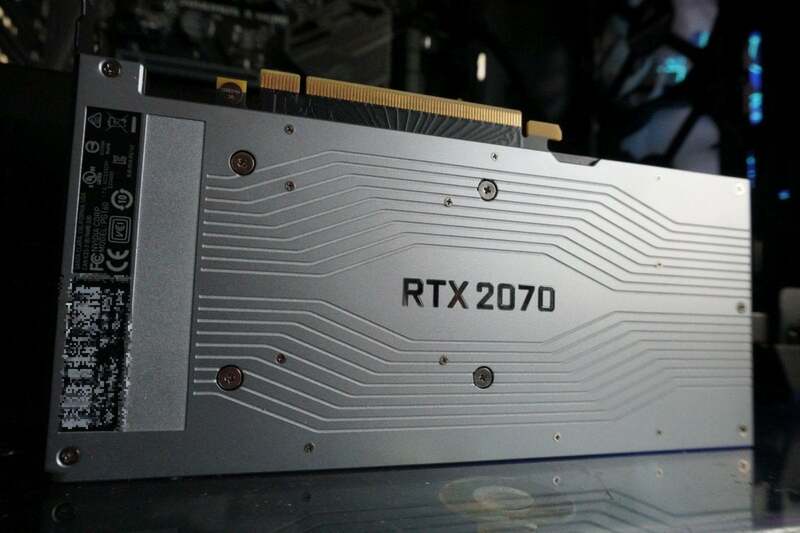 You won’t find an SLI/NVLink connector on the card, though—the RTX 2070 isn’t intended for use in multi-card systems. Nvidia’s RTX 2070 feels luxurious and substantial. I love it. Check out the Founders Edition design section of our RTX 2080 and 2080 Ti review if you want deeper details. We’re moving onto benchmarks. The Nvidia GeForce RTX 2070 Founders Edition packs futuristic hardware for ray tracing and AI-enhanced graphics, but it's also faster than the competition in traditional games. Nvidia's design is gorgeous, but similar performance can be achieved with lower-priced RTX 2070 graphics cards.